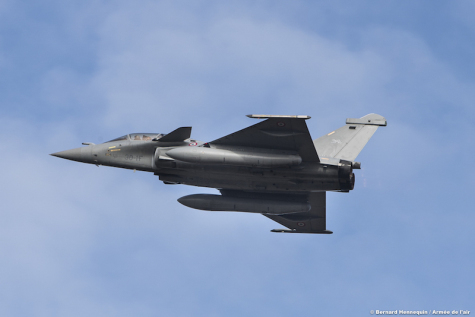 On Monday, December 10, 2018, the first Rafale aircraft upgraded to the French Air Force’s latest F3-R standard, made its first flight from Air Base 118 at Mont-de-Marsan. Implemented by the Air Force’s air trials expertise center, the F3-R standard is the latest step in the Rafale's evolution since its entry into service in 2004. Awarded in December 2013, the contract for this new standard will mainly allow Rafale to operate the long-range Meteor air-to-air missile, the Talios target designation pod and the laser-guided version of the Modular Air-to-Ground Weapon (AASM), adapted to hit moving targets. On F3-R, there are evolutions in many fields, but the most important one is the one related to the safety and the protection of the aircraft and its crew: the Automatic Ground Collision Avoidance System (AGCAS). This forms a sort of protective bubble around the aircraft, so to avoid a collision with the ground when, for example, a pilot loses consciousness. This is the first time such a system has been fitted to a French military aircraft. For the air force’s military air trials center (CEAM), flight tests will continue for several months to assess and define the operational doctrine and tactics that will be recommended to the forces.